This is a wonderful stew recipe. It adds a bit of tanginess as well as sweetness with the addition of apple cider and just a bit of catsup (or ketchup). The bit of acid in the apple cider helps the stew become very, very tender. Place the flour and seasonings in a large plastic ziptop bag. Shake to mix. Add the beef to the bag, a few pieces at a time. Shake to coat. Heat the oil in a large saucepan over medium heat and brown the beef. Drain. Stir in the cider and catsup. Reduce the heat to low. Cover and simmer for 1 1/2 hours or until the meat is tender. Add the vegetables and simmer another 30 minutes, until tender. This recipe comes from the delightful cookbook Autumn in the Country Cookbook . 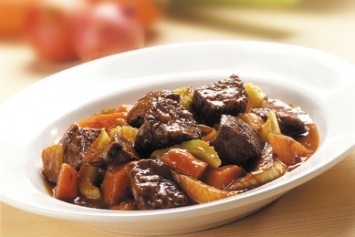 This is one of the nicest beef stew recipes I have tried in a long time. This easy beef stew is a meal in a bowl, perfect for cool days, with a slice of fresh crusty bread on the side. You will find the easiest ever beef stew recipe here. You don’t even need to brown the meat!